When it comes to my two teaching hats, English and Yoga, they don’t so much overlap. I mean, they could actually coexist and come together quite nicely, but what I mean is that my schedules of teaching both have been intentional and mindful. I can only do so much, and my body tends to tell me in loud and clear ways when I try to do more than it wants. For that reason, when I agreed last spring to take on more adjunct hours than ever before for this fall semester, I knew my yoga teaching would have to take a step back for a bit. And really, I was fine with that because I have learned a great deal about balance this year and no, I do not mean physical balance and funky asana. I mean ebb and flow, hard and soft, action and stillness. There has to be balance between the doing and the being. To me, that is living yoga. When I made the decision this summer to leave the studio at the start of September, I did not know exactly where my yoga would land. I was – and still am – teaching at the Y, of course, and had – and still have – my hands quite full with CCC. 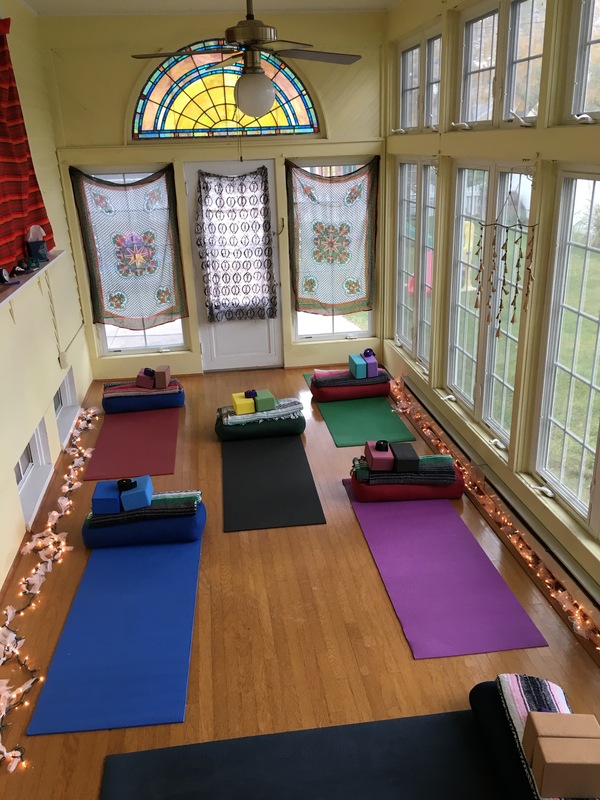 I hadn’t originally planned to teach any more anything beyond that this fall, but then I started doing more of my own practice here at home and realized I still had space, energy, and love to share, so I did. And just like that, I began teaching yoga, on my own, on my sun porch.